One of the wonderful things about Cattleya species is that there is always one in bloom every day of the year and you come to associate each with a particular season. 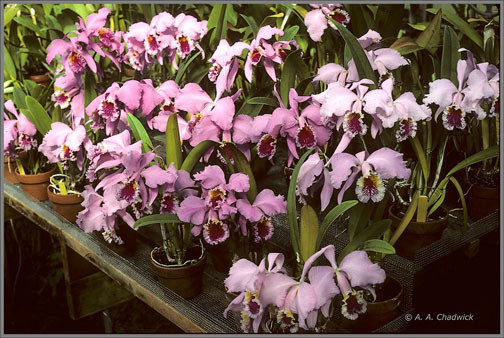 So when the days begin to lengthen and the sun grows stronger, you know the greenhouse or sun porch will soon be filled with one of the brightest, largest and loveliest rose-lavender cattleyas in nature’s storehouse, Cattleya mossiae. Springtime is Cattleya mossiae time. Since C.mossiae blooms in abundance during the months of March, April and May, it is in bloom for Easter, Mother’s Day, all the spring dances and graduations and most of the spring flower shows. It is no wonder, then, that it was the darling of the commercial cut-flower industry in the 1940s and 1950s, and that it was still grown for cut flowers long after the other Cattleya species had given way to fancier hybrids. Cattleya mossiae was the second unifoliate Cattleya species discovered after Cattleya labiata, and it caused a sensation when it was introduced into the horticultural world in Europe in 1836. Unlike C. labiata, which was scarce or unavailable, C. mossiae plants were plentiful and anyone who had money to spend, could buy them. Cattleya mossiae also had large, showy flowers with four or five flowers per spike and multiple leads, so a single plant in a 10-inch pot could produce 20 or more flowers. They were ideal for exhibition at flower shows where everyone saw them. Between 1865 and 1913, the Royal Horticultural Society gave its coveted awards, including 37 Awards of Merit and 16 First Class Certificates, to 53 C. mossiae clones. The number of named clones of C. mossiae is almost endless and there were already more than 150 recorded in the literature by 1900. Much loved in its native Venezuela, C. mossiae was given the honor of being named the country’s national flower. This was quite an accomplishment, as Venezuela lays claims to eight Cattleya species including the impressive unifoliates, Cattleya leuddemanniana, Cattleya percivaliana, Cattleya gaskelliana and Cattleya jenmanii, and it speaks volumes for the people’s love of C.mossiae. Because it flowers in the spring, C.mossiae does not begin growing until midsummer, well after such species as C. labiata and Cattleya trianaei have completed their growths. Cattleya mossiae often does not complete its growth until October and then it usually sends out a flush of new roots from the new growth. It can be repotted at this time and still produce a strong flower spike in the spring. Like other cattleyas, C. mossiae should only be repotted when it begins sending out new roots from the lead pseudobulb. Cattleya mossiae should be given lots of water while actively growing in the summer and early autumn, and then watered sparingly during the cold winter months when it is dormant. Cattleya mossiae grows best if you allow it to dry out thoroughly before watering it again. When you do water, give it a thorough watering that wets all the roots in the container. Cattleya mossiae requires plenty of sun and air, and will give more flowers the more sun it receives. It is receiving too much sun, however, if the leaves feel warm to the touch. Cattleya mossiae requires a normal cattleya temperature of 58 F at night and up tp 85F during the day. Fertilizer is not needed to produce good growth or flowers, but can benefit plants grown in bark mixes. One-quarter teaspoonful per gallon of water of a soluble 20-20-20 given weekly during active growth in August and September is recommended. Use a cupful of this solution per plant per watering. Never use slow-release fertilizers. These may release nitrogen when the plant is dormant and this could cause injury to the plant. Without C. mossiae, spring hybrids would be few and far between. Virtually all of our good spring cattleya hybrids today have C. mossiae in their background. The most famous of C. mossiae spring hybrids is the semialba form of Laeliocattleya Canhamiana, which is a primary hybrid with semialba Laelia purpurata. This hybrid so dominated the June cut-flower market at one time that it was known as the bridal orchid. Thomas Young, in Boundbrook, New Jersey, grew more than 10,000 semialba Lc. Canhamiana plants in 8-inch and 10-inch pots (150,000 flowers), yet still could not meet the demand. 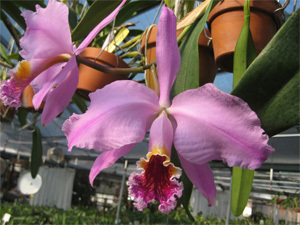 There are more alba forms of C. mossiae than any other Cattleya species, probably because of its abundance. One of the first white forms of C. mossiae to be exhibited was awarded an FCC by the Royal Horticultural Society in 1885. The exhibitor, Sander’s, gave it the clonal name ‘Wageneri’ and the name ‘Wageneri’ came into common usage for many years to mean an alba form of C. mossiae. You still see C. mossiae plants with labels that read “Cattleya mossiae wageneri variety Easter” or wageneri variety this or that. Similarly, the first form of C. mossiae to receive an FCC from the Royal Horticultural Society in 1871 was given the varietal name ‘Reineckiana’. The plant was reproduced as a plate in the famous orchid book, Reichenbachia and the name “Reineckiana’ came to mean a white C.mossiae with a lavender lip. One of the most famous breeding semialba C. mossiae of all time, C. mossiae reineckiana ‘Young’s variey’ still carries this descriptive name. Most of the famous old cultivars of C. mossiae have the classic mossiae shape, where the broad petals tend to fall forward. This unique shape distinguishes C. mossiae from most of the other species of Cattleya. The only FCC awarded by the American Orchid Society to this species, C. mossiae ‘Mrs. J. T. Butterwoth’ , has petals that fall forward in the typical fashion. Cattleya mossiae is apparently so proud of this shape that it passes it on to its hybrids. The lavender forms of C. mossiae present a wide range of color in the sepals and petals, from pale rose to dark purple. Most C. mossiae have the typical lip pattern where the purple has a splashed appearance but there are also a few varieties without this pattern. One of the most famous lavender-breeding C. mossiae is the cultivar ‘R.E. Patterson’ (not to be confused with ‘Ed Patterson’, which is a different variety0. ‘R.E. Patterson’ has unusually large flowers and a shape where the petals are upright instead of falling forward. Its shape is the main reason it was so widely used in breeding, but it also has a unique lip pattern where the dense lavender splashing goes all the way to the edge of the lip. There are also several tetraploid cultivars like Patterson’s famous ‘Orchidhaven’.